Imagine mixing a vivid red paint, a little at a time, with a gray paint of the same value. If you started with gray and gradually added red until the vivid red color was obtained, the series of gradually changing colors would exhibit increasing chroma. The scaling of chroma is intended to be visually uniform and is very nearly so. The units are constant. The scale starts at zero, for neutral colors, but there is no arbitrary end to the scale. As new pigments have become available, Munsell color chips of higher chroma have been made for many hues and values. The chroma scale for normal reflecting materials extends beyond 20 in some cases. Fluorescent materials may have chromas as high as 30. 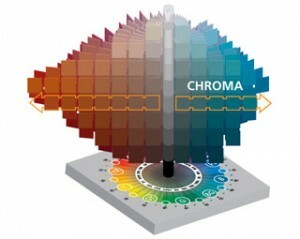 Now that you understand chroma, you can learn more about hue and value. Studying the hue circle comparison.